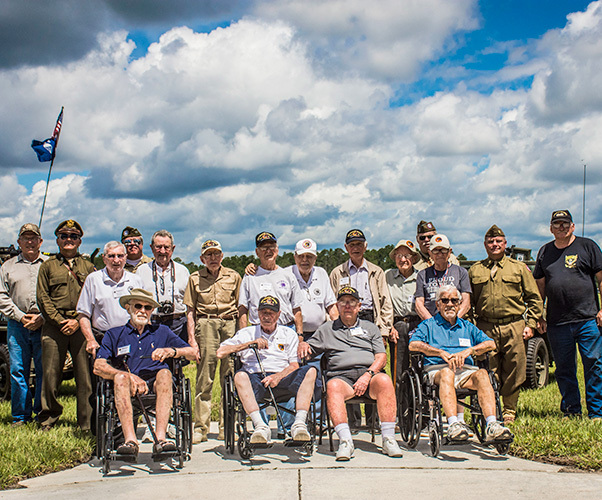 Veterans of the Army 66th Infantry Division pose for a group photo during the division’s final reunion and site dedication at Camp Blanding Joint Training Center’s museum in Starke, Fla., June 15, 2018. For years, veterans of the Army’s 66th Infantry Division have reunited to reminisce about their time together fighting in World War II, to share stories of how their lives have changed since then, and to recall fond memories of those brothers they lost along the way. They have taken many journeys together, but none have been as impactful as their June 15 return here to the Camp Blanding Joint Training Center for their final reunion. The 15 veterans of the 66th “Black Panther” Division and their families were welcomed to the Camp Blanding Museum by post commander, Army Col. Matt Johnson, who shared how he was personally impacted by their stories. Upon taking command of Camp Blanding in 2015, Johnson said he would enjoy a morning run past the troop billeting areas on Quincy Avenue, which just happened to be located behind what used to be the headquarters for the 66th Infantry Division. Johnson ran his usual route again on the morning of the reunion to prepare for his meeting with veterans that trained at his post all those years ago. “I could still imagine the voices and the sounds of men rising early, preparing for another day of training at Camp Blanding. I thought of what you experienced then and what we experience today,” he said. 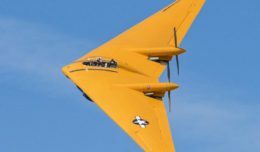 Johnson said he was also touched by the story of one of the veterans in attendance, Cyril Reshetiloff, who served in Headquarters Company, 2nd Battalion, 262nd Infantry Regiment. Reshetiloff was on board the S.S. Leopoldville, a Belgian passenger ship that was torpedoed and sunk by a German submarine as it was crossing the English Channel to deliver members of the 66th to fight at the Battle of the Bulge. While Reshetiloff was able to climb his way out of the wreckage and swim to safety, the 66th Infantry Division lost 14 officers, including two battalion commanders, and 784 enlisted men in that attack. Instead of continuing to the original battle, the Black Panther Division was assigned to fight 60,000 Germans along the French Atlantic coast. They later relocated to Koblenz, Germany, following the German surrender in May 1945, where they conducted occupation duty and provided security at German prisoner-of-war camps. The men who left to continue the fight after Leopoldville consider the sacrifice made by their fallen brothers to have saved their lives. Jerry Roetigers, President of the Panther Veterans Organization, and one of the young men who trained at CBJTC and went on to fight with the 66th Infantry Division, said the PVO has boasted as many as 2,500 members since it was created in the 1960s. He recalls emotional moments when the PVO went to Europe and placed a wreath at the location where the Leopoldville was sunk, and later when they placed one at the Tomb of the Unknown Soldier. The members of the 66th Infantry Division have been honored for their sacrifice and praised for their legacy. Their final reunion at Camp Blanding was no different. Dozens of Soldiers, airmen and civilians turned out in the hot summer sun to pay their respects to the brave men of the Black Panther Division. Several World War II-era vehicles led the convoy of buses around post, bringing back memories of the unit’s time here, but also providing a reminder of how much time has gone by. Army Capt. Kimberly Quinn enjoys a laugh with World War II Army veteran John Dietz following the 66th Infantry Division’s final reunion and site dedication held at Camp Blanding Joint Training Center’s Museum in Starke, Fla., June 15, 2018. Roetigers had his grandson — who is also named Jerry and is a veteran who served in Iraq — read an article written by his friend and previous PVO President Frank Bartino, and the current CEO of the Panther organization, Lenore Angelo, titled, “Roses in December.” The heartwarming words remember comrades that fell during the war and have passed away since. Just before laying a wreath on the monument, each of the 12 Black Panther Division veterans in attendance received a 66th Infantry plaque and a CBJTC challenge coin. The veterans noticed on their tour of Camp Blanding that while the post has changed tremendously over the years, the spirit of sacrifice and service remains. 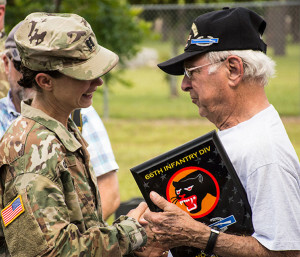 During the ceremony, currently serving Florida National Guard Soldiers and airmen stood proudly as they donned the same style “Black Panther” Division patches as the heroes who had gone before them wore when the 66th Infantry Division was activated on April 15, 1943. “We are very proud of the 66th Infantry Division’s record in World War II, and we are extremely pleased that you have come home in 2018,” said the president of the CBJTC Museum Association, George Cressman.